Anyone following our progress over the years will know that in partnership with our sister company, Alban Shipping, we’ve been asked to pack and transport a huge range of objects – from scale models of the Titanic and Pete Waterman’s train collection, to McLaren sports cars and a valuable Chinese Dragon Clock. We thought we’d share some of the more unusual projects we’ve undertaken as part of our ‘Making a Case‘ blog. 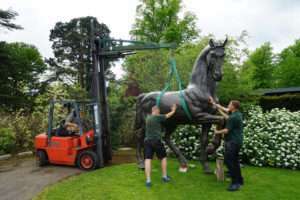 First up, a high-value bronze horse that needed a temporary – but robust – ‘stable’ for its journey from the UK to its new home on the east coast of the US. 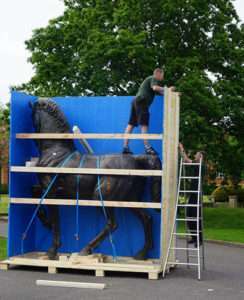 As you can see from the images below, the bronze was big – far too big to fit into a standard sea-freight container. Therefore, it fell to our expert team to create on-site a custom-built wooden shipping crate in which to house the horse. 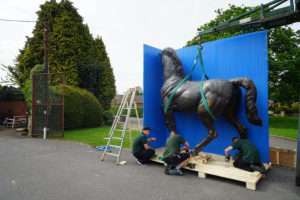 The case would need internal waterproofing and the creation of a number of packaging inserts and supports for the horse itself. 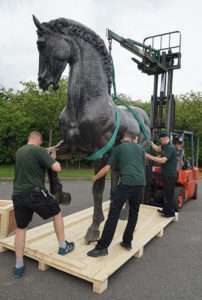 However, the first step of the process was for the team to strap the horse to the forklift, and carefully lift it onto the base of the crate. With the horse in place, the team could build the case around it, a process captured in perfect detail by our in-house photographer. You can see the amount of care we put into the building of each shipping case, and examples of our legendary attention to detail. When it comes to the protection of our client’s valuables, we stick to the principle that every case we make is built to the highest standards in the industry, providing the maximum protection possible, and complete peace-of-mind for the client. Here the team works on the supports vital to guarantee the necessary support for a piece as heavy as the horse. Note the blue waterproof sheet on the crate wall. The crate starts to take shape. Additional support to sides and bottom, plus support for the horses hooves. The finished crate, with inspection hole and bronze Dobbin inside. 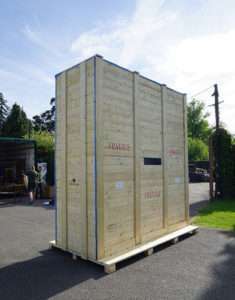 The finished crate (and its equine cargo) was then loaded onto a low-loader and transported to the UK port, where it set sail on its long seabound journey to the States. We only hope someone remembered to pack enough straw and carrots to ensure the trip was comfortable!